In a Nutshell: Stitcher — a customizable and portable internet talk radio platform — helps brings listeners credible, knowledgeable news sources in a modern and entertaining format. 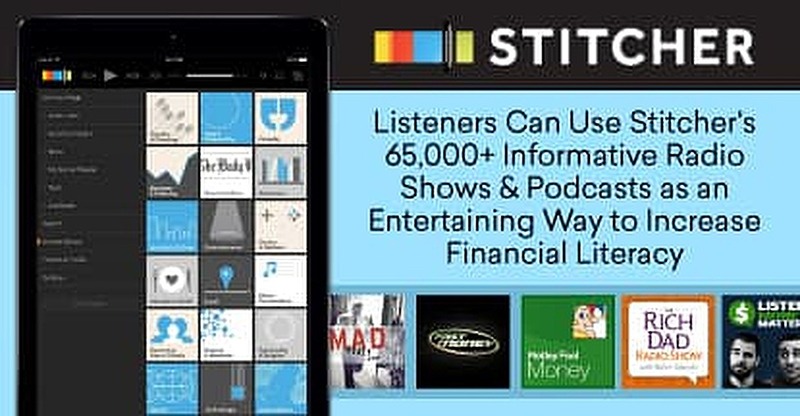 Users can tune in from their devices to stream one of Stitcher’s more than 65,000 podcasts ranging in topics from business and finance to politics and comedy. In today’s fast-paced and ever changing environment as to how consumers interact with and learn about money, Stitcher’s many broadcasts focusing on money, investing, and overall personal finance can act as informative, fun, and sometimes quirky resources covering best practices and tricks for managing your money. Growing up, financial expertise brought an image to mind of a man in a suit behind a heavy banking desk, filing mysterious forms and reading “the numbers” in the newspaper on his lunch break. For most of us, that world felt foreign and inaccessible — somewhere far from our day-to-day lives and monthly budgets. But today, we live in the golden age of information with apps, podcasts, and other outlets feeding the 24-hour news cycle. Becoming versed in formerly dense concepts like financial literacy now feels totally attainable. If you’re already an internet radio fanatic, you’re probably familiar with Stitcher, a free platform that lets you stream news stations on countless topics, from entertainment updates to comedy podcasts and political debates. Stitcher’s also quickly becoming a hub for money tips and essentials you can access anywhere, on your own time, like a long work commute or between meetings. Think of it as money management self-help for the modern era, placing the power of financial knowledge directly at your fingertips. Before diving head first into the countless money and finance podcasts available on the service, let’s talk about the basics: what Stitcher is, why you care, and how you get on board. The service offers more than 65,0000 radio shows, live stations, and podcasts you can access on demand. That means you’ll be able to discover entertainment that speaks directly to you, whether it’s a podcast on your favorite sports team or an episode of This American Life. But Stitcher takes convenience one step further — the platform will send you recommendations based on your preferences and what similar listeners are also into — it’s like having access to a friend who always knows the Next Big Trend before it happens. From comedy to finance and politics, Stitcher’s more than 65,000 shows offer something for everyone. Downloading the free app to your phone (or any smart device or tablet) means you can take podcasts with you and keep them in one centralized location. You can then “stitch together” all your favorite podcasts into one playlist so you can sit back and simply hit “Play” to catch up on your favorite shows. For the radio entertainment obsessive, Stitcher offers a premium service ($4.99/month, $34.99/year) that gives you ad-free access plus all sorts of perks, like bonus episodes of your favorite shows and a few original podcasts only available to premium customers. Regardless of where your interests lie, we all share one thing in common: money. Whether you can’t seem to get enough, save enough, or you have too much (right. ), it’s inevitable that money plays a huge role in your life, even if talking about it makes you want to squirm. Fortunately, Stitcher’s finance-specific podcasts provide you with a way to get more financially savvy without having to step foot in a bank or log on to an investment site (although some of the tips you’ll learn will make you want to do exactly that). Really, you can learn all about retirement accounts or how to tackle credit card debt without leaving bed or having to face anyone besides your own reflection in your iPhone screen. Remember that scary image of the man in the suit working in a big office shuffling financial paperwork? Jim Cramer, host of CNBC’s Mad Money, is that guy. A successful finance manager on Wall Street, he knows his stuff and spends his podcast telling customers in plain English what they should do with their own investments. Jim Cramer, host of Mad Money, gives listeners the financial advice they need in plain English. Cramer’s goal is simple: “to show you how to make money investing by diligently exploring opportunities and avoiding pitfalls.” The host is strongly opinionated, and his audience appreciates the sound, confident way he presents his knowledge. Another CNBC favorite, Fast Money’s hosts are real traders who talk about the the best stock trades of the week. The idea of stocks might automatically make you feel like taking a nap, but avid listeners to Fast Money argue this show makes the topic anything but boring. CNBC’s Fast Money features expert guests to give Stitcher listeners a weekly glimpse into the market. The mix of new and recurring guests provide expert financial insights, and the show’s entertaining format means there’s never a dull moment. Listeners are sure to finish each session of the show with great ideas on how to most effectively invest their money. Good name, better show. Each week the Motley Fool Money team gets together to discuss the top financial and investing stories, the occasional interview, and, of course, the stocks. Motley Fool Money broadcasts sound investing input and summarizes each week’s top financial stories. Each episode focuses on a theme — recents include “The Hidden Logic of Motivation,” “The Trump Investor,” and “Starbucks’ Venti Change.” The variety in programming ensures there’s something for everyone, regardless of financial interests. Another good name with an equally smart premise, The Rich Dad Radio Show offers “in-your-face advice on investing, personal finance, and starting a business.” You’ve probably heard some pretty dated guidance about how you should save and invest your money — the Rich Dad (Robert Kiyosaki) wants to challenge all the conventional approaches you’ve been taught to follow. We don’t all have rich fathers, but self-proclaimed “Rich Dad” Robert Kiyosaki can help listeners shape finances. These aren’t get-rich-quick hoaxes. Each episode will consistently help you set yourself up for lifelong financial stability. Listen Money Matters claims it’s “not your father’s boring personal finance site.” This is a show about how to sensibly address and change poor money management habits in the modern world. Listen Money Matters gives Stitcher users tips on getting out of debt, managing money, and more. The show’s episodes give actionable advice on how to do very basic, yet incredibly important things like (finally) getting out of debt, implementing a realistic budget, and investing. The hosts espouse the goal we can all retire early together. Thanks to streaming technologies employed by platforms like Stitcher, consumers don’t have to turn to people in board rooms and three-piece-suits to learn about the financial world. Instead, listeners can easily start building a portfolio of their favorite podcasts on topics that interest them and impact their daily lives. To get smart about money, you have to start somewhere, and Stitcher makes it easy. Its features let you build multiple custom playlists, search content for old episodes you might have missed (or your next favorite show you’ve never heard of), and share your favorites with friends. We’re all in this paycheck-centric world together, and access to financial knowledge has never been more attainable.